What are the causes and consequences of climate change? When the scale is so big, can an individual make any difference? Documentary, diary, and masterwork graphic novel, this up-to-date look at our planet and how we live on it explains what global warming is all about. With the most complicated concepts made clear in a feat of investigative journalism by artist Philippe Squarzoni, Climate Changed weaves together scientific research, extensive interviews with experts, and a call for action. Weighing the potential of some solutions and the false promises of others, this groundbreaking work provides a realistic, balanced view of the magnitude of the crisis that An Inconvenient Truth only touched on. Climate Changed is printed on FSC-certified paper from responsibly-managed, environmentally-sound sources. 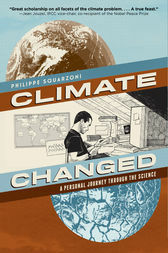 Find teaching guides for Climate Changed and other titles at abramsbooks.com/resources. Philippe Squarzoni attended college in Lyon, France. He visited Croatia and the former Yugoslavia several times as a volunteer in a conflict-resolution project and traveled through Mexico, Palestine, and Israel as a human-rights observer. He has published graphic novels on Central American politics and the Holocaust, and on author Richard Brautigan.